Work related musculoskeletal disorder (MSD) is considerable occupational health-care problem worldwide, both in advancing and industrial countries and the common reasons of which are non-ergonomic actions during lifting or pulling, repetitive tasks and stretching positions or doing tasks under stable and improper physical conditions. Health-care providing jobs are considered as high-risk MSD among others. Fujishiro et al., notes in his study that 12% of health-care providers in the U. S suffer from occupational injuries predominantly occur in their back or shoulders. These types of injuries have led to the loss of work time in more than 600 thousands staff per year and incurring 45–54 Billion dollars and consequently a reduction of workforce productivity., Among health-care providing jobs, nursing is identified as a high-risk occupation for MSDs because of their intensive physical activities along with bending, turning, long time standing, patient transferring, and lifting heavy objects. Hedge (2009) points out in his study that more than 40% of the injuries reported for nurses come from patients transferring from which 75.9% have resulted in a backache. De Castro et al., have reported the incidence of backache in Philippine nurses about 80%. These authors have demonstrated that the increased incidence of backache or pain in legs are related to the nature of nursing career especially tasks like patient transferring, or handling, when getting the patients dressed or their repositioning. Hegarty, et al. (2003), showed in ergonomic assessment of Intensive Care Unit (ICU) nursing stations in the U. S hospitals that patient handling obtained the highest score (10) in REBA tools which is a tool to evaluate the occupational status of health-care occupations such as nursing. Therefore, this task is a high-risk task for nurses, and a prominent modification is necessary to change it. To reach this purpose, ergonomics is a helpful science. Ergonomics is the science of fitting the job to the worker, the practice of designing work tasks and equipment to conform to the worker's capabilities or adjusting the work environment or work practices to prevent injuries before occurring. Ergonomics purpose is to assure that the tasks, equipment and work environment mostly conform to the conditions of each worker. Patients are in a highly dependent on their nurses in ICU and also operating room tasks needs more assistance of nurses and working in these wards can lead to various injuries in nurses. Numerous studies have been conducted in other wards. The present study, however, attempts to provide an investigation on assessment of ergonomics of doing tasks in ICU and operating room wards and their comparison in hospitals under the cover of medical science and healthcare services of west Azerbaijan province to show the current status of these activities by risk level analysis and the relevant basic and necessary data. It is also expected that the results of the study could be useful in macro planning and training or executive strategies aiming at the reduction of the work leading to injuries and identification of the causes of musculoskeletal problems, accordingly. This is a descriptive-cross sectional study which ergonomic relationship during work in nursing staff of ICU with operating room wards in the studied hospitals in 2015. The study population was selected by means of a census method from all the nurses working at ICU and operating room ward of the hospitals covered by medical science and health-care service university in southern regions of west Azerbaijan province of Iran (100 nurses) if qualified the specifications of the study conditions for the mentioned wards. The predefined characteristics to qualify the study participation were: Having at least a relevant academic associate degree, full time employment, lack of developing MSDs, hearing the study subject words, lack of a surgery operation for MSD disorders, loss of vision or audience problems affecting the individual's tasks according to the subject statements, participation in patient repositioning in ICU or operating room wards and consent to take part in the study. The study environment included ICU and operating room of the hospitals covered by the medical science and health-care services university in southern regions of west Azerbaijan province. Data collection tools of the study included: an author-designed questionnaire in the field of the subject demographic information (age, gender, work experience, qualifications, height and weight), Rapid Entire Body Assessment (REBA) and Nordic questionnaire. The demographic information data were completed by the studied nurses through self-performance method. Body mass index (BMI) was measured by the authors and data relating to the posture of different parts of the nurses' bodies when repositioning the patients from one side to another were gathered by the authors from nurses working at ICU and operating room wards under three different conditions during each work shift and were recorded on REBA, accordingly. Given that the type of activity varies in each ward and in ICU, patients are highly dependent on nurses and surgical operations in the operating room require some patients, and the work of nurses in both wards creates various injuries, the type of damage and its amount is unknown, using the REBA tool can be effective. REBA is comprised of a particular coding for movement range of each part of human body which is scored according to the different standing and dynamic movements, quick movements and unstable status. According to the tool guideline, the author can determine the risk incurred to each part with different ranges of risk level including negligible, no need to change the current position (score 1), low risk level in which position change may be required (score 2-3), moderate risk level in which quick change in position is required (score 8-10) and high risk level in which a shocked change in position is required (score 11-15) after the scores record of each movement in REBA tool and computing the total score (ranged 1-15). Finally, referring to the small size of the study population divided by the mentioned ergonomic rates, the risk level results were categorized into two groups of low-risk level (score 1-3) and moderate risk level (score 4-15) and the author has ergonomically considered the low-risk level as desired and moderate and higher risk levels as undesired results. In REBA, organs are divided into two groups: A (trunk, neck and legs) and group B (arms, forearms, and wrists). In this method, the author and an expert choose the worst position during work in addition to capturing photos and REBA will analyze them, accordingly. Measuring the results of epidemiologic researches in the field of MSDs. The validity and stability of the tools were measured and confirmed. The study tools were applied after gaining the relevant permits and introduction letters and presenting to the nursing officials of the health-care centers. Data were collected from the first part of the questionnaire after obtaining consent from the studied subjects in a self-performance manner except items 8 and 9 which were considered in measuring BMI. The second part of the tool was completed through observing by the author. To control the intervention factors, first, the questionnaires were distributed among the subjects satisfied to participate in the study (through census method), completed and the ergonomic postures were separately examined for each individual in operating room and ICU wards by the author within three times (during early, middle and end of the work shifts). The study data were analyzed by descriptive (average and standard deviation) and deductive (Chi-square and t-test) tests in SPSS software. The study findings revealed that women obtained the highest gender frequency in operating room group with 34 nurses (68%) and ICU for with 35 nurses (70%). In operating room group, most subjects aged 25–29 (56%) and in ICU group they were 20–24 years old (69%). The study nurses obtained predominantly a normal BMI both in operating room (74%) and ICU groups (70%) ranged 18.5–25 (normal range of weight). In operating room group, 28 staff had associate's degree (56%), and in ICU group, 45 subjects had bachelor's degree (90%). The number of married nurses in the operating room and ICU obtained 30 (60%) and in 32 (64%), respectively. The longest work experience years obtained 1–5 (53%) and 5–10 (66%) years for operating room and ICU group, respectively. 85% of the studied nurses in operating room and 90% in ICU group stated that they had not taken any posture training course, yet and 55% of the subjects in operating room and 57% in ICU group were not aware of their job risks. As shown in [Table 1], the maximum rate of complaint percentage about musculoskeletal system in operating room group was related to the back (68%), neck (44%) and knee (40%) and the minimum rate was observed for wrist (8%). Furthermore, the highest rate of complaint percentage about musculoskeletal system in ICU group was obtained in back (60%), upper back (48%), and shoulder (46%) and the minimum rate observed in elbow (8%). The results also demonstrated that the operating room staff group most frequently referred to the occupational health-care centers for neck ache with 10 subjects (20%), however, no one referred for pain in knee and wrist, 4 (8%) referred to physiotherapy centers because of neck complaint, 1 (2%) for complaint of elbow and thigh which was the minimum rate. In ICU group, the most frequent reference to the occupational healthcare centers occurred for pain in the waist for 4 subjects (8%) and the least one reported for elbow pain with 0 subject. In this group, 4 subjects (8%) referred for MSDs of knee and 1 (2%) for elbow and wrist pains, respectively. 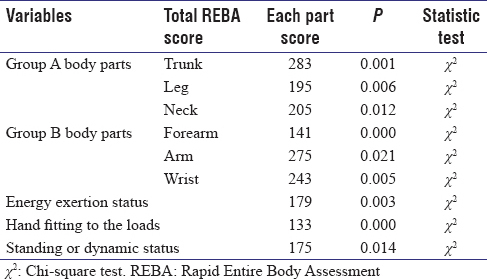 The comparison between the scores obtained for group A and B for variables such as body, energy level, hand fitting to the load and standing and dynamic activities and REBA total scores in two groups of ICU and operating room demonstrated that there was a significant relationship between body, legs, neck, arm, energy level, hand fitting to the load, and standing and dynamic activities with REBA total score in both groups (P < 0.05) [Table 2]. 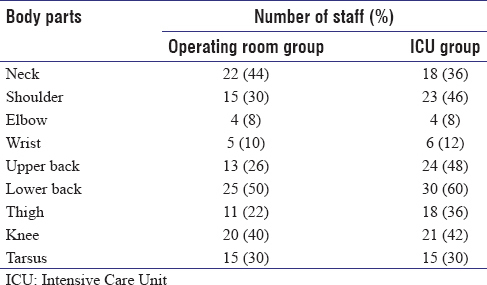 In ICU and operating room groups, hand fitting to the load status was appropriate, with the highest frequency value of 41 (82%) and 30 subjects (60%), respectively [Table 3]. The activity status showed that in operating room group, 29 subjects (58%) postured in a standing status and 5 (50%) performed repetitive tasks with a shorter range of movement [Table 4]. Analysis results from comparing demographic factors and REBA total scores in operating room and ICU groups showed that there was no significant relationship between REBA total score and education level (P > 0.05), while there was a significant relationship between REBA total scores and age, work experience, BMI, and gender (P < 0.05). In operating room and ICU groups, most studied personnel scored 11–15 and obtained very high-risk level which needed emergency actions to correct the conditions [Table 5]. In addition, the results showed that there was a significant relationship between risk level and total score in ICU and operating room groups (P < 0.05). In the present study, the assessment of prevalence of MSDs in two studied groups of operating room and ICU revealed that the most frequent disorder was observed for waist or back the results of which were inconsistent with the those obtained Khosroabadi et al., which approved the prevalence of backache up to 57.8% and obtained the highest score among MSDs. In addition, in a study conducted by Tinubu et al., the results demonstrated that within the past 12 months of the study the prevalent MSD was observed in back (44.1%). Back or waist injuries and the consequent pains occur when the functional unit tissues are suffered. Functional unit tissues make an individual do bending, turning, and twisting. Moreover, it makes the spine bear the total body weight easily. It seems that the tissue injury in nurses (nurses working in ICU and operating room) is resulted from hard working conditions, twisting movements in spine, inappropriate physical postures (over twisting or turning), patients repositioning, and prolonged bending. According to Munabi et al., study which was carried out on 880 nursing staff, prolonged or over bending, handling or pushing heavy loads were the key reasons for waist injuries. In a study of Nabirye et al., it was revealed that pushing or pulling loads exceeding 20 kg, prolonged bending or twisting were the key causes for MSDs. In another study, it was demonstrated that nursing especial tasks related to patients repositioning or handling required sudden movements, bending, turning, lifting, and abnormal postures. According to Smith et al., a 1-year MSD prevalence of 85.5% was reported for nurses. In study of Lorusso et al. (2007), pain in shoulders, neck, upper body and lower body, was reported 49%, 36%, 31% and 54%, respectively. Pompeii et al., in his study also stressed that one-third of his nursing staff of the study population developed MSDs 83% of which were caused by nursing works. In the present study, a significant relationship was seen between total REBA score and the corpus, forearm, arm, energy level, hand fitting to loads and dynamic/standing tasks (P < 0.05) both in ICU and operating room groups. Over bending and stretching of body drastically recorded for ICU and operating room nursing staff. For instance, a nurse should turn on both sides with a torsion of 20–60 degrees or bear weight on one foot and make a bending over 20 degrees in neck, bend arms lower than 60 degrees or over 100 degrees and bend or stretch 45°–90° in arms. For nurses working at other wards and operating room, the amount of applied force, energy and workload to do the duties or tasks were not equal. For hand fitting to loads variable, a significant relationship was reported between the two groups (P < 0.05). Comparing the two groups showed that the hand fitting to loads status in operating room group was moderately resulted from working with handle assistant tools, in spite of good score of this status, while ICU group workers frequently faced with patients or objects handled with no handle assistant tools. In operating room group, tasks were often performed statically, and the body could be retained for 1 min, while in ICU group the staff movements repeated often more than 4 times/minute. Comparing the two above mentioned expressions, one can conclude that activity status was in a higher range of movement and they had more side activities than those working at operating room group. Therefore, there was a significant relationship between the two groups in standing and dynamic status. The study results revealed that a backache was highly developed by increasing the age in both groups. Kjellberg et al. concluded that younger individuals adapted to the safe work techniques more rapidly and comfortably than the older did. Since no comprehensive orderly training course was hold for the proper usage of body mechanics during work, forgetting academic courses and lack of their review and also repeated routine tasks could also increase MSDs development by age increase. However, it should be noted in mind that age increase process is normally correspondent with the loss of motor function or physical potentials of an individual body which leads to apply insufficient or weaker techniques and finally prevalence of intensive pains derived from MSDs. Referring the obtained results from the present study, doing regular exercises in both groups reduced the development or experience of a backache. Numerous studies have revealed that backache is dramatically less developed in individuals who regularly exercise. Daily exercise can boost and protect the back muscles to get better compatible with sudden loads or shocks, hence reduction of frequency and intensity of backaches against abnormal loads or forces. The present study findings showed that women staff experienced higher risks of inappropriate ergonomic status in both groups which highlighted a higher risk taking level in women toward MSDs, as numerous studies confirm the high level of these disorders in women against men as well as the study of Comerino et al., in which prevalence of backache was found considerably in women among all the studied groups. Furthermore, Nicot revealed in his study that MSDs increased from 25.7% to 58% during 2003–2008 worldwide, according to the comparative data published by the French International Statics Institute. The highest prevalence of these disorders among women probably depends on factors such as pregnancy and delivery experience in women which requires more research. On the other hand, men nurses apply more secure techniques once handling patients from bed to wheelchairs. Mandel et al., study was also conducted to assess the relationship between high-risk nursing care service tasks and MSDs among nurses in the U. S which demonstrated that moderate or high prevalence of the disorder was significantly seen in women (66%) than in men (31%) for at least one part of the body during 7 days before completion of the questionnaires. As for gender distribution inequity in both groups of the present study operating room and ICU, most subjects were young with a few work experience years which confirmed their physical power to face with factors enabling MSDs. Moreover, nurses hardly performed ergonomic standards in ICU and operating room for their work background knowledge; thereby their ergonomic status was evaluated undesired comparing with those experiencing fewer years of work. This might be resulted from increased work experience years and following that, the long gap between academic formal and clinical courses and information in the field of ergonomic principles against those with fewer years of work experience which could lead to the risk of MSDs development in both groups. There was a significant relationship between BMI and REBA total score in both groups (P < 0.05) more than the normal level which was in consistent with Hosseini et al., study results. Lorusso et al. explained in his study that BMI could prone the individuals to the MSDs. Karahan and Bayraktar, highlighted the role of obesity on backache which could result in a reduction of abdominal muscles stretching or lumbar lordosis increment. Alexopoulos et al. concluded in his study that a high BMI was in a significant relationship with chronic back pains, absence from work or pain in shoulders. In this study, a significant relationship was observed between the risk level and REBA score in both groups (P < 0.05). The subjects had different education degrees and were not equally aware of their occupational risks and the higher educated staff could perform more tasks and duties rather than those with lower levels. There was a significant relationship between risk level and REBA scores in the two groups, and the obtained risk level was very high and high in the operation room and ICU groups, respectively. The risk of the body part hurt was existed which required emergency initiations. In the study of Hosseini et al., conducted by means of REBA method, 71% of the nurses were subjected to a moderate level of risk. In the study of Dias et al., performed on different techniques of nursing tasks, the risk level was reported moderate. In work of Abdalla et al., conducted by REBA method for different nursing techniques, the risk level was obtained high and very high. Health-care service jobs are needed to be basically trained in terms of relevant tasks, risks and their control methods. Nurses working in operating rooms and ICU ward are subjected to a high-risk level principally originated from incorrect body postures and special conditions of working. Therefore, corrective actions along with preventive planning are to be performed to avoid disorders in the future and the formation of training classes, periodic visits to wards, periodic examinations, rest periods and leave for staff it is suggested. Helander M. A Guide to Human Factors and Ergonomics. 2nd ed. Published in 2006 by CRC Press Taylor & Francis Group 6000 Broken Sound Parkway NW: Nanyang Technological University Singapore; 2006. p. 17-24. Hedge A. Back Care for Nurses; Available from: http://www.spineuniverse.com/wellness/ergonomics/back-care-nurses. Hegarty C, Rosenberg Y, Stecker R. Ergonomic evaluation acute. Cornell University: Care Nursing Health Center; 2003. p. 1-14. Khosroabadi AA, Razavi SM, Fallahi M, Akaberi A. The prevalence of musculoskeletal disorders in health-Treatment employees at Sabzevar University of medical sciences, Iran in 2007. Sabzevar Univ Med Sci 2010;17:218-23. Naghdi S, Nokhostin Ansari N, Rastgo M. Understand your backache: A guide to prevention, treatment and relife. Tehran: Argomand; 2010. p. 17-8. Munabi IG, Buwembo W, Kitara DL, Ochieng J, Mwaka ES. Musculoskeletal disorder risk factors among nursing professionals in low resource settings: A cross-sectional study in Uganda. BMC Nurs 2014;13:7. Abedini R, Choobineh A, Hasanzadeh J. Musculoskeletal disorders related to patient transfer in hospital nursing personnel. Health Syst Res 2012;8:385-96. Pompeii LA, Lipscomb HJ, Schoenfisch AL, Dement JM. Musculoskeletal injuries resulting from patient handling tasks among hospital workers. Am J Ind Med 2009;52:571-8. Kjellberg K, Lagerström M, Hagberg M. Work technique of nurses in patient transfer tasks and associations with personal factors. Scand J Work Environ Health 2003;29:468-77. Mandel JH, Lohman W. Low back pain in nurses: The relative importance of medical history, work factors, exercise, and demographics. Res Nurs Health 1987;10:165-70. Comerino D, Cesana GC, Molteni G, Latcca R. Job strain and musculoskeletal disorders of Italian nurses. Vol. 2. Job strain and musculoskeletal disorders: IOS Press; 2001. p. 215-23. Nicot AM. Women more at risk of musculoskeletal disorders. France: ANACT; 2008. p. 35-8. Hosseini M, Varmazyar S, Safari A. Assessing body condition in hospital emergency personnel training article with a rapid assessment method and its relationship with total body skeletal disorders muscle. J Med Sci Qom 2009;3:32-9. Lorusso A, Bruno S, L'Abbate N. A review of low back pain and musculoskeletal disorders among Italian nursing personnel. Ind Health 2007;45:637-44. Karahan A, Bayraktar N. Determination of the usage of body mechanics in clinical settings and the occurrence of low back pain in nurses. Int J Nurs Stud 2004;41:67-75. Alexopoulos EC, Burdorf A, Kalokerinou A. Risk factors for musculoskeletal disorders among nursing personnel in Greek hospitals. Int Arch Occup Environ Health 2003;76:289-94. Dias N, Nunes IL. Analysis and risk assessment of work-Related musculoskeletal disorders in a physical rehabilitation unit. Int J Hum Factors Ergon 2012;1:318-32. Abdalla D, Sisconeto de Freitas F, Chieregato Matheus J, Porcatti de Walsh I, Bertoncello D. Postural biomechanical risks for nursing workers. Fisioter Mov 2014;27:421-7.